The perfect board to get you started. WRS’ uniquely designed Limited Edition skimboards measure 19.5″ wide x 39″ long and weigh about 5lbs. If you are interested in buying a board, please use the purchase form below. We will also be selling these boards down at the beach throughout the summer for $90. PLEASE NOTE: All payments are done through PayPal, but don’t worry, you do not need a PayPal account! You are still able to pay with your Visa or Mastercard through PayPal, you will just need to fill in the information when you are directed to the PayPal payment page. 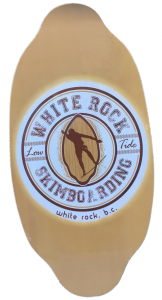 Copyright © 2014 - 2019 White Rock Skimboarding. All Rights Reserved.